New merchandise releases at Disney Theme Parks are all in a day’s work, and it seems like Steven, Michelle and I are constantly discovering new products to divulge. We recently came across one (actually its two items for the price of one) that were just too good to keep to ourselves. The newest arrival to Disney Theme Park Merchandise can’t be found in stores or even at DisneyParks.com/Store. It’s a brand-new merchandise opportunity that allows you to shop ‘til you drop and gives you something special (and collectible) to add Disney magic to your home. Created especially for Disney Theme Park Merchandise, the Disney Parks Shopping Card and Deluxe Framed Castle Pin Set for $1,000 gives you two great items to enjoy. 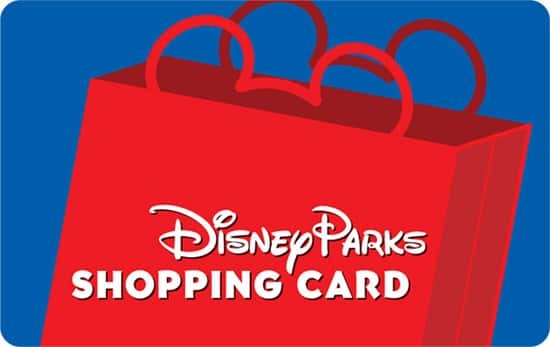 The Disney Parks Shopping Card allows you to shop for merchandise items at Disney Parks with ease! 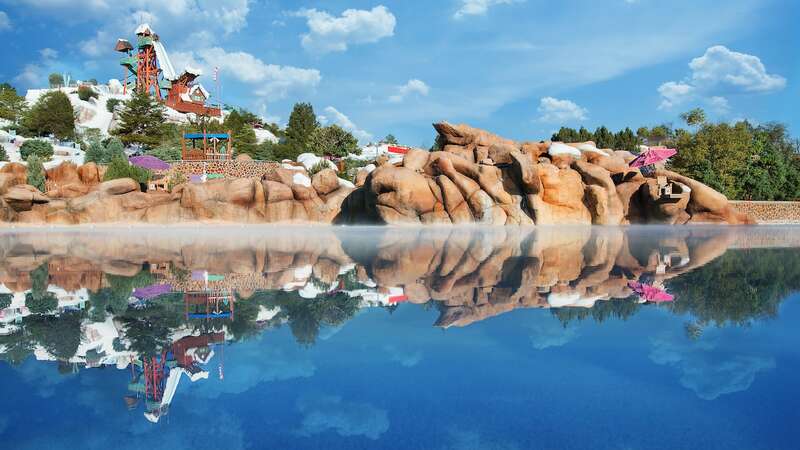 Use your $1,000 Disney Parks Shopping Card at Disney owned and operated merchandise locations at Walt Disney World and Disneyland Resorts, and Disney Vacation Club Resorts located in the U.S. 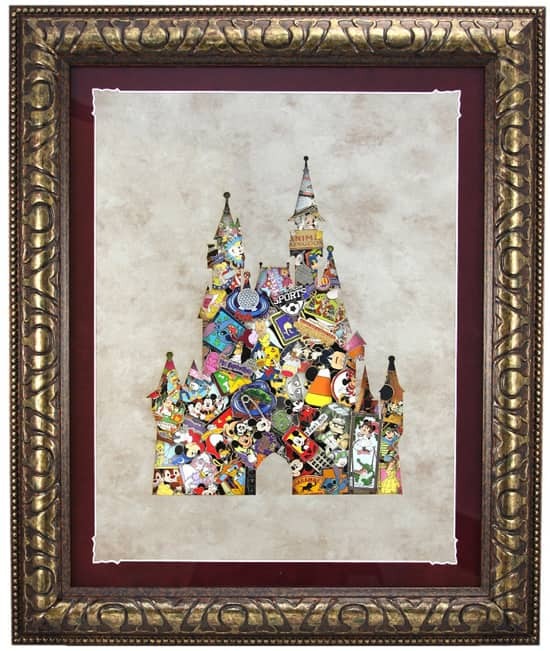 The elegantly framed Deluxe Framed Castle Set features as many as 60 authentic Disney pins that have been framed and double matted to create a whimsical image of Cinderella Castle. The stylishly framed pin set measures 24”H x 20”W and is truly a stunning piece of art. The Deluxe Framed Castle Pin Set cannot be found in stores or online it’s only available with the purchase of the Disney Parks Shopping Card. There isn’t a better way to get started with your holiday shopping than with the Disney Parks Shopping Card and Deluxe Framed Castle Pin Set – you can shop for gifts to give and you’ll get a great framed piece of art to keep for yourself! There are a few terms and conditions that apply to the card, you can read all the terms and purchase the Disney Parks Shopping Card and Deluxe Framed Castle Pin Set by clicking here. I like the little pin thing, but I don’t like it $200 worth. I’ll stick to regular gift cards. For what period of time would this card be valid? It says “may be subject to expiration” but they couldn’t tell me when I called if that would be after 1 week, 1 year or some other period. Wow! This sounded great until I saw the fine print hidden that my Annual Pass Discount is not valid with purchases made with the Disney Parks Shopping Card. That means that as a Premiere Passholder, my purchases would be $200 more expensive using this “shopping card” than if I just purchased everything outright. Makes the framed set $200 plus $5 shipping and a $15 processing fee. I would love to purchase this but I can’t see giving up my discount on purchases for $1000 total. This card cannot be used in conjunction with annual pass holder discounts. That means as a Premier passholder, I would lose my 20% discount. I would only buy this if I really want the framed pin set…. Who’s buying that much Disny? $1000? Wow! !